#MadarakaDay Todays Madaraka day was Unique and Worst, done with "Kikuyu language" instead of National Language. - Bana Kenya News, Real African Network Tubanane. Home News #MadarakaDay Todays Madaraka day was Unique and Worst, done with "Kikuyu language" instead of National Language. #MadarakaDay Todays Madaraka day was Unique and Worst, done with "Kikuyu language" instead of National Language. Todays Madaraka day was unique and worst compared to all other national holidays. The today's function was majorly in Local language. People were confused as they knew Kiswahili or English are the national languages. "Raila Odinga cannot address people in a local Kikuyu event dubbed as "Kikuyu Madaraka day". He was a spectator." Embakasi East Mp Babu Owino said. 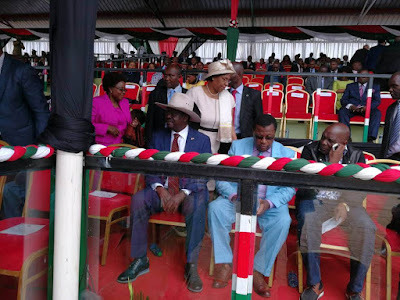 Kenyans on Twitter took the event to the social media claiming that the organizers were to be fired after the function because they ashamed the President and his Deputy. The Deputy President needed to hire a translator for the national event. The public Event which was attended by the Government and opposition was to show a national unity but turned to be a "Kikuyu Local unity". The President and his deputy were embarrassed from the other regions for depicting a picture of Country division in ethnicity rather than Unity. If I were Uhuru, I would have fired & whipped all the organisers of today's #MadarakaDay function. Its a major embarrassment. Nonsense!!! This is not #MadarakaDay this is KIKUYU NATIONAL HOLIDAY. Why, why, why, are they speaking so much Kikuyu at the #madarakaday ceremony? Shame, shame on you Nyeri leaders! Shame! Shame! Shame! How can Jubilee decide to lacalize #MadarakaDay which is a national day to all Kenyans? Their tribalism nature was displayed today clearly. While today should be a celebration of Kenya attaining internal self-rule, tweets on #MadarakaDay show how deeply divided Kenyans are today! This event is such a nonsense. How can this be called #MadarakaDay when almost everything is in a local language?